WASHINGTON, D.C. -- Diabetes among American adults is estimated to cost the U.S. economy an additional $245.5 billion in 2017 in total healthcare expenditures. These results are based on the diabetes rate of 11.5% thus far in 2017 and are coupled with an estimated incremental healthcare cost of $8,480 per person compared with those who have not been diagnosed with diabetes. *Diabetes estimate (2017 YTD) based on data collected Jan. 2-Sept. 30, 2017. **Total U.S. adult population based on current U.S. Census Bureau estimate. 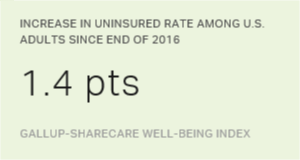 These data are drawn from more than 135,000 interviews with U.S. adults across all 50 states and the District of Columbia so far in 2017 as part of the Gallup-Sharecare Well-Being Index. These findings are from a report released today, The Cost of Diabetes in the U.S.: Economic and Well-Being Impact. The estimates for the incremental healthcare utilization costs per person, which have been adjusted for inflation, are drawn from research by the American Diabetes Association. The extra costs per person per year have been conservatively computed by the ADA to account for overlapping costs of other chronic conditions commonly associated with diabetes. Since 2008, the national adult diabetes rate has risen nearly one percentage point, elevating the current cost estimates. If the diabetes rate had remained steady at 10.6% since that time, the estimated healthcare expenditures due to diabetes in 2017 would be about $19.2 billion less than they currently are. Diabetes costs the U.S. economy in more ways than just extra healthcare utilization. One such way is lost productivity in the form of unplanned absenteeism, which costs U.S. employers an estimated $20.4 billion annually. The diabetes rate thus far in 2017 is 6.3% among full-time workers and 9.1% among part-time workers. Full-time workers with diabetes miss an average of 5.5 extra workdays per year, and part-time workers with diabetes (after reducing to half-day estimates) miss an additional 4.3 days. This amounts to nearly 58 million additional days of unplanned missed work each year among workers who have been diagnosed with diabetes, compared with their counterparts who do not have diabetes. Assuming a cost of $354 per day for the average worker across occupations, lost productivity due to absenteeism related to diabetes costs employers $20.4 billion annually. This analysis controls for age, gender, income, education, race/ethnicity, marital status, children in household, geography and BMI weight class. *Diabetes estimate (2017 YTD) based on data collected Jan. 2-Oct. 15, 2017. Controls for age, gender, race/ethnicity, income, education, marital status, children in household, region and BMI weight class. Assumes $354 per missed workday. Diabetes has become a major health problem in the U.S., resulting in significant costs to the U.S. economy. And healthcare utilization and unplanned absenteeism are only two potential ways that chronic conditions such as diabetes can affect it. Other ways not examined in this article include actual performance while at work, voluntary and involuntary turnover, and workers' compensation claims. The slow climb in diabetes prevalence of about one percentage point over the past decade mirrors the three-point climb in obesity, which has been found to quadruple the risk of diabetes for working-age U.S. adults. Among workers, the occurrence of diabetes is not evenly distributed across occupations, nor are its risks. Transportation workers have both the highest current rate of diabetes and the highest risk for new onset diabetes in the future, posing unique challenges for this industry. According to the Centers for Disease Control and Prevention, 86% of the nation's $2.7 trillion in healthcare expenditures comes from people with chronic and mental health conditions, underscoring the critical nature of both managing disease states when they are present and preventing them in the first place. Population health programs such as Blue Zones Project in California's Beach Cities have a proven track record of reducing above-normal weight and smoking rates while boosting exercise and healthy eating. These behaviors play a role in reducing reports of diabetes diagnoses among residents. Employers, too, can play a decisive role in their workers' lives by establishing incentives, recognition systems and workplace cultures designed to promote active living and healthy choices. And hospitals and health systems serve a vital purpose in diabetes and glycemic management, which can improve health outcomes and lower the costs of care -- both inpatient and outpatient -- for people with diabetes. Opportunities exist for hospitals and health systems to partner with local employers to bring diabetes education and prevention to work sites. "While most clinicians agree that managing diabetes improves health and reduces medical costs, the benefit to employers also extends to a more productive workforce," says Sheila Holcomb, vice president, Sharecare Diabetes Solution. "An opportunity exists for employers to partner with the medical community, specifically Certified Diabetes Educators at local and regional hospitals, to offer diabetes education and training to their employees with diabetes. This collaboration has tangible and proven value for both the individual and the company's bottom line." Read the full report, The Cost of Diabetes in the U.S.: Economic and Well-Being Impact. The overall diabetes rate and estimated healthcare costs are based on 135,426 telephone interviews with U.S. adults across all 50 states and the District of Columbia, conducted Jan. 2-Sept. 30, 2017. The missed-work estimates among workers are based on 80,136 interviews with full- or part-time workers conducted Jan. 2-Oct. 15, 2017. Gallup conducts 500 telephone interviews daily, resulting in a sample that projects to an estimated 95% of all U.S. adults. The margin of sampling error for diabetes prevalence for all U.S. adults is ±0.2 percentage points, while the margin of error for full-time workers is ±0.3 points and the rate for part-time workers is ±0.6 points. All reported margins of sampling error include computed design effects due to weighting. Each daily sample of national adults in 2017 includes a minimum quota of 70% cellphone respondents and 30% landline respondents. Additional minimum quotas by time zone and within region are included in the sampling approach. 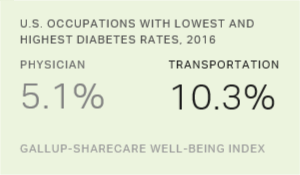 Transportation workers, followed by farmers/fishers/foresters, have the highest diabetes rate among major occupations. Physicians have the lowest.